On Tuesday, April 7th, go vote! I heard on the news last Wednesday that the Americans United for Separation of Church and State was going forward with their lawsuit over Elmbrook schools using Elmbrook Church for their graduation. Argh. First of all, there is No Separation of Church and State clause in any of our founding documents as interpreted by this group. But that aside, why is it when one person squawks and we all have to change? "Earlier this month, the New Berlin district abandoned its plans to use Elmbrook Church for Eisenhower High School's graduation. The ceremony will be on the school's football field. New Berlin Superintendent Paul Kreutzer has said to avoid a showdown with Americans United for Separation of Church and State. WCTC and Mukwonago still plan to hold their ceremonies at the church. In the lawsuit filed against Elmbrook in U.S. District Court in Milwaukee, the group argues that holding commencement at the nondenominational Christian church violates the Constitution's ban on government establishment of religion by coercing parents and students to enter a religious institution for a public school event." New Berlin is holding theirs outdoors? That is taking a chance in Wisconsin--it could be a real mess. It could cost their district in field repairs too. WCTC and Mukwonago are still planning to use Elmbrook Church? 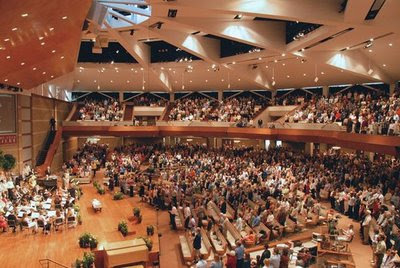 I am thinking that tells me that Elmbrook Church is probably the nicest, largest facility in our area? You would think WCTC would have some venue that would work for graduation, but the Elmbrook location is nice? Probably they don't have anything comparable in accessibility and amenities. Many of them [those filing the suit] feel uncomfortable with having the ceremony in the church because "Elmbrook Church teaches that persons who do not subscribe to the church's Christian beliefs will suffer torment in hell for all eternity," the suit says. I noticed that those bringing the suit couldn't bring themselves to say that Elmbrook Church teaches that persons who do not believe what the Bible, God's word, teaches about the necessity to believe in Jesus Christ or be separated from God for all eternity. They made it out like Elmbrook Church is being unreasonable or hateful in preaching the Bible's position. The ultimate truth of the Bible still pertains to all regardless of the graduation setting. Plus, if you are atheist, you don't believe in any of that anyway--God, the Bible, Jesus, hell. What is the difference? Atheists certainly manage to use U.S. currency that states "In God We Trust. So for all of a student's 12 years of school, Christian students in the Elmbrook School District must endure an atmosphere of A-Theism while attending classes. But on this one day of their school career, the 1 student bringing the suit cannot endure an hour with 1 symbol of Christianity--something they don't even believe in? "...it's less expensive for the district to rent a venue than to stage it within the school, with the custodial overtime, the take down, the set-up, etc." The choice of Elmbrook Church auditorium is one of practicality and economy, not of proselytizing. Now if someone will just sneeze at the right time, we could have an invocation too. I read through the lawsuit. It strikes me that much of the complaint hinges on the plaintifs' assumptions about the meaning of various objects and actions that they have/might encounter on the premises--their feelings about what they suppose to be the feelings of others--and some of those others (such as the ones who genuflected) are much confused themselves about what the environment demands. The short answer is "nothing." The environment demands nothing. This debate reminds me of the high emotion attached to the subject of breastfeeding. Some women will tell you how much pressure there is to wean their babies. Other women will tell you how much pressure there is to nurse their babies. Perhaps there is only the pressure we bring to the situation. I personally have very strong opinons about both subjects, but I'm not easily offended. I would be comfortable in a religious venue not of my preference, and I will be content (if not comfortable) in a gymnasium later.